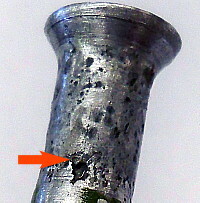 Stainless steel hardware (rivets, bolts, screws) installed into an aluminum fitting creates a potential for dissimilar metals (galvanic) corrosion. Leaking hydraulic line from aircraft brake system caused by galvanic corrosion. Aircraft brake systems are drenched in electrolyte (dirty water) so extra caution is advised when mixing metals. Notice that the gap between the tubing and sleeve can trap moisture into the crevice. "Stainless steel parts are cadmium plated and primed if they are attached to aluminum or alloy steel parts." Boeing Aircraft Aero No. 07 "Design for Corrosion Control"
"Aluminum structure shall be insulated from non-aluminum fasteners" Navy Ships' Technical manual Chapter 075 Fasteners, page 75-59. "Dangerous corrosion will result if steel, corrosion-resistant steel, Monel, titanium, copper, or iron rivets are used in riveting aluminum structures. Such applications should be confined to extreme emergencies" US Air-Force-Airframe-Repair-Specialists (AFSC 42755), Repair Procedures, page 16. News article from King5 News in Renton Washington November 24, 2008 concerning stainless-steel-nutplates not being coated with cadmium. Now, tens of thousands of others lack an important coating of cadmium. That nearly invisible coating is important because it prevents the stainless steel nutplate from reacting with the airplanes aluminum, which can lead to corrosion. Spirit says the untreated nutplates from one of their suppliers got mixed in with treated plates from another were installed by the thousands. Spirit employees are now inside Boeing plants trying to find and replace the bad nutplates on new jets. The reason corrosion is such a problem in load bearing structures is that the corrosion pitting provides the perfect nucleation points for fractures to form and propagate from. They must be repaired promptly and properly.